For many years now, the Flemish government has been encouraging its citizens to use renewable energy, and solar power in particular. But how do you know whether your rooftop is suitable? How much solar potential does your rooftop have to offer? And will you be able to write off the investment within an acceptable time span? The new online platform ‘Zonnekaart’ gives you the answers you need. Approximately 12 % of the buildings in Flanders use renewable energy from solar panels, but many more are able to benefit from it. This means that a lot of us aren’t taking advantage of solar power. The online platform ‘Zonnekaart’ wants this to change. Everyone is now able to see whether their rooftops are suitable for solar panels. The website also makes a quick estimate of installation costs, checks the savings on electricity bills, and more. No long searches on the internet, no unanswered questions, just facts that give you the information you need to decide whether it’s worth making the move to solar power. 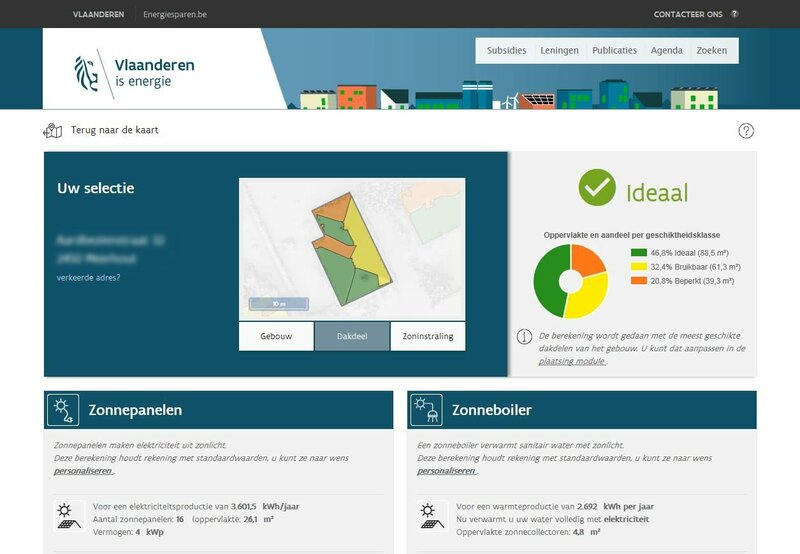 The project started at the beginning of 2016 when the Flemish Energy Agency (Vlaams Energieagentschap - VEA) contacted the Flemish Information Agency (Informatie Vlaanderen - IV) and VITO Remote Sensing to develop an online platform that would provide information on the solar potential of every building in Flanders. To realize this, we have used a detailed digital surface model derived from a laser-altimetry campaign run by the Information Agency over the past years. This results in up to 16 elevation measurements per square meter. This allows us to see objects such as small chimneys and surrounding trees that could cast a shadow on the solar panels and have an impact on their efficiency. 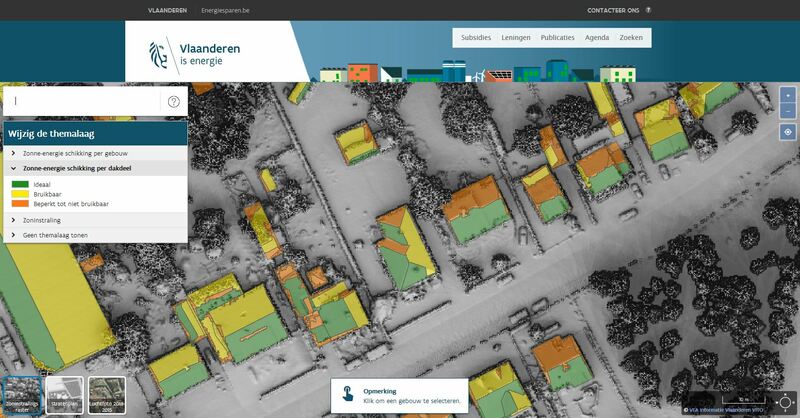 The expertise of IV and VITO Remote Sensing in processing big data combined with the computer infrastructure of the Image Processing Chain Flanders, made it possible to provide very specific information on the grade and orientation of the rooftops. By simulating the sun’s path across the sky every day of the year, shadow from trees, surrounding buildings and other objects could be taken into account and combined with cloud cover statistics provided by the Royal Meteorological Institute. As a result, the solar irradiation for every 25 cm2 location resolution could be determined. By combining all this data, Zonnekaart can give an objective assessment of the solar potential of any rooftop in Flanders. To find out whether it would make sense for you to install solar panels, the Flemish Energy Agency integrates current average installation and electricity costs, subsidies, VAT regulations and more. Anyone interested is then given an estimate of the installation costs, the electricity bill savings, the reductions in CO2 emissions, etc. that would result. A dedicated web application guides you to the valuable information you need and even a list of certified installers. Zonnekaart is designed for all kinds of users, from households of four or more to companies with over 500 employees. The tool is designed so that settings can be adjusted to your personal consumption. Zonnekaart is aimed more at raising awareness than pinpoint accuracy. It certainly gives you a good view and accurate information to decide whether solar energy is a worthy investment for you or not. If it is, a certified installer will then be happy to evaluate your circumstances to help you make a definitive decision. For more information, please visit http://www.energiesparen.be/zonnekaart.